With summer upon us, your Houston pool deck will be seeing a lot of traffic. 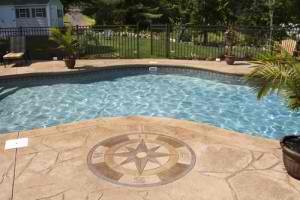 Start the season off right with a pool deck scrub down. These tips from HGTV make it a breeze. If you encounter a nail that has worked loose from a board, remove the nail with a cat’s paw or a hammer. Use a screw that’s longer than the nail to reattach the board. Even though pressure-treated lumber resists insects and decay, it’s still vulnerable to moisture and the sun’s rays. To preserve it without changing the color, use s clear wood preservative that contains a UV protector, which will bring new life to the surface while protecting it from the elements. If you want to add color, use an exterior stain first. Exterior stains come in both solid and semi-transparent finishes. Always use the semi-transparent for the decking area, but try a solid color if you want to highlight railings or banisters; it ends up looking like a painted finish. Exterior stains are available in oil or latex, and both provide fade and mildew resistance.